Why Go To The Dorset Coast? Yes, yes, Broadchurch and The Jurassic Coast... The view of 18-mile Chesil Beach and Portland from Abbotsbury could be as satisfying as victory in the annual Dorset Knob Throwing contest. Spectacular coastal features like Lulworth Cove, Old Harry Rocks and Durdle Door add to the already impressive array of sandy beaches and swimming spots, strung together on the South West Coast Path. The Dorset coast's highest point is also the highest on the entire south coast: Golden Cap (191m). Lording it proudly over a valley a few miles inland is the Cerne Abbas Giant. Getting there: 2.5 hours by car from London, same by train. Travel times from where you are: See the Dorset Coast on Google Maps. Guidebooks: Rough Guides cover Dorset, Hampshire and the Isle of Wight in one guidebook. Charles Tait does a guidebook specifically on Dorset. Walking route guidance: South West Coast Path or the Dorset AONB walking guide. Professional adventurers Dave Cornthwaite and Alastair Humphreys do Dorset in a way that Ernest Shackleton might not have. The BBC's Ramblings podcast ventured to Dorset on this episode. 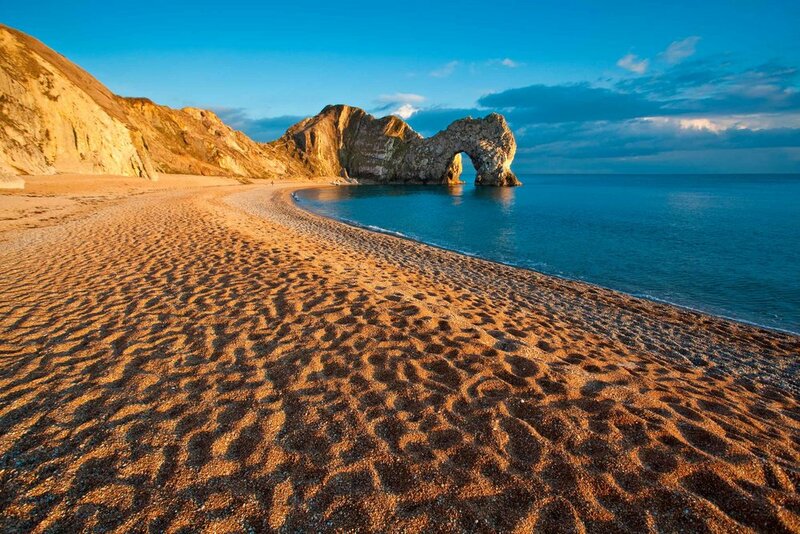 Part of the Dorset coast has the rare accolade of being a World Heritage site.